"Vegetarian eats good for the heart and soul"
Looks nice:The dishes are attractive to the eye and each plate is decorated with flower-shaped carrots, tomatos and cucumbers. 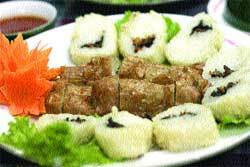 Roll call: Bach Ngoc Kim Ke, fried glutinous rice with mushroom, carrot and chicken, is one of the best dishes in the restaurant. Address: 94 Khuat Duy Tien St, Thanh Xuan Dist, Ha Noi. Comment: Warm atmosphere with Buddhist melody, delicious food and countryside drinks, affordable prices. For the health concious and people who just relish vegetarian dishes once in a while, Kim Cuong Vegetarian Restaurant is a cleansing choice for a night out. It's menu is also different from the run-of-the-mill vegetarian fare. The restaurant is owned by the Venerable Thich Minh Tri, of the Buddhist executive council, the first Venerable to open a vegetarian restaurant in Ha Noi, not only as a healthy alternative, but also to raise funds for charity. Kim Cuong is easy to find at 94 Khuat Duy Tien and has Buddhist apartments on the upper floors. It is about 8km from the capital's centre, and definitely worth seeking out. It's usually busy so reservations are required, especially on the first and middle day of the lunar month. On the night I visited this unassuming restaurant, a gentle Buddhist melody led me to a small room decorated by pictures of Buddha. It was offered eugenia tea and other countryside drinks of Viet Nam, together with vegetarian dishes which are made of plants, roots and fruit such as carrots, tofu and mushrooms. The hot "seafood" soup is an ideal choice for the first course. Don't worry about its name: it's made from a kind of mushroom that tastes like "seafood", as explained by chef Kieu Tri Truong. It is white and soft and contains a rich volume of protein – "very good for health". The soup also tastes of mushroom, vegetarian shrimp, carrot and asparagus. The consume is made of juice from pear and apple. A pinch of pepper makes it perfect. Eating vegetarian food to Buddhist music is relaxing. Everything is light and pure from the air to the dishes leaving you feeling light-hearted. Even the dishes have dainty names. For me, it is a celebration of vegetables, fruits and roots with natural colours. All dishes are pleasant to the eye, each is decorated with a floweret of carrot, tomato and cucumber. A salad is served as an appetiser with no oil and vinegar to enhance the taste. Its attraction is the pure ingredients of scraped coconut, yam bean, cucumber, carrot and sesame. Popular main courses include a deep-fried combination of grated vegetarian fish; potatoes and tofu with lotus seeds inside; fried flour-soaked aubergine; stewed "beef"; "fish - meat" "pig's trotters" stewed with lotus seed; "snail" simmered with green banana and tofu; braised "fish"; various soups made of mushroom, vegetables, roots and fruits. In Ha Noi, there are many vegetarian restaurants, all much the same. The difference with Kim Cuong Restaurant is the speciality dishes created by chef Truong. Take for example Nom Co Hu Dua. It is made of coconut sprout – scraped and mixed with carrot, banana flower, cucumber, spice vegetables, ground nut, sugar, salt, vinegar and chilli. This dish is one of the best I have ever experienced. And Bach Ngoc Kim Ke, which is fried glutinous rice with mushroom, wooden ears fungus and carrot and chicken made of tofu milk. Venerable Thich Minh Tri is a member of the Viet Nam Buddhist Sangha's Executive Council, chief of Ha Noi Diocese's Secretariat and nun of Quang An Pagoda in Ha Noi and Ha Tien Pagoda in Vinh Phuc. He opened the restaurant as an "expectation and donation from Buddhists" and wants to help people taste the gusto and understand as well as advantages of good food, while creating jobs for young people. But most important is that profits from the business will be sent to the poor and orphans. Venerable Tri says most people who come to the restaurant are not vegetarian, therefore it is necessary to make dishes which originate from vegetables, roots, fruits and seed to have the flavour of normal dishes. "The most important thing is the use of spices to bring out the special flavour of every dish and keep the customer interested," Tri says. For this the chef needs creativeness and enthusiasm. 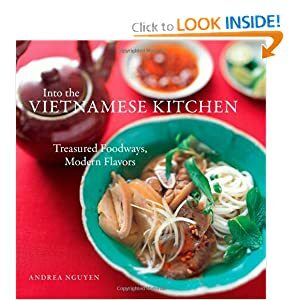 Chef Truong, who studied cooking in Hue, which is well-known for vegetarian food, is one of best graduates from the city. He takes the original recipes and makes them even more sublime. For example, he learned to make steamed "pig's trotters" in Hue, from which he created four other dishes, including "trotters" roasted with salt and chilli, "pig's legs" steamed with lotus seed, pig's legs steamed with herbal medicine and "trotters" steamed with red wine. With a menu of nearly 200 dishes, Kim Cuong Restaurant can serve budget conscious customers without compromising style and nutrition. A portion of rice or noodles using the method of any nominated region, costs VND20,000-25,000 (US$1 - 1.2) each. 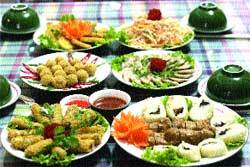 A tray for six people, with various dishes, costs from VND500,000 to 1 million ($25-50). Even if you are not a vegetarian, a night at this restaurant will put a spring in your step, even more so if you are lucky enough to meet and talk with Venerable Thich Minh Tri and learn more about Buddhism.